The Amal Mark 1 Concentric carburetter was introduced onto motorcycles during the 1967 model year. A lighter and more compact carburetter than the preceding Monobloc the name derives from the design of the float chamber around the main jet, an arrangement intended to reduce the effect of fuel surge in the float bowl under cornering and transient throttle conditions. Mark 1 Concentric carburetters are available in 4 Stroke and 2 Stroke configurations and can be left or right handed depending on the position of the tickler mechanism and adjusting screws. Clean and inspect banjos and filters. Plastic banjos should be replaced with metal banjos as they tend to harden and crack with age. Carefully inspect the filter and replace if torn or if there are deposits on the mesh that can’t be removed. Rust fragments in the filter may indicate a problem in the petrol tank that can cause carburation problems in the future. Inspect the gasket surface of the float chamber carefully for damage. The gasket surface should also be inspected for flatness. Light damage and irregularities can be remedied by dressing the surface using fine abrasive paper on a flat surface, or fine grinding paste on a plate of glass. If the surface is reduced too far however, the depth of the slot for the float spindle will become too shallow and may cause difficulties with the operation of the float. 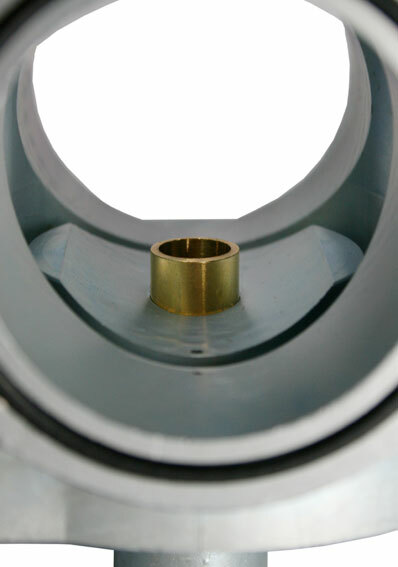 Over-tightened Allen bolts, which are a popular modification, can bend the lugs and cause an air leak within the float chamber into the idle circuit. If the lugs are bent the float chamber should be replaced. 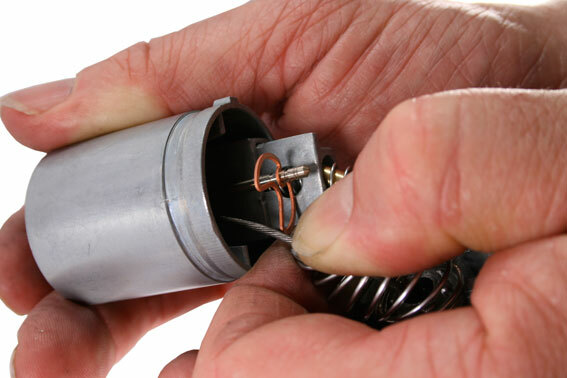 Clean and inspect the float chamber drain plug which acts as a sump for the float chamber. Replace it if it shows signs of hardening with age. Early versions of the Mark 1 carburetter were not fitted with drain plugs. 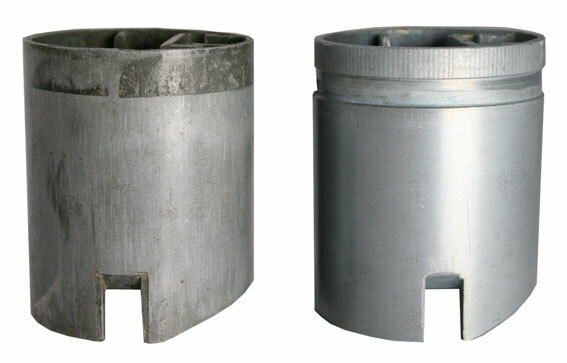 These carburetters were fitted with a brass mesh sleeve filter fitted around the Main Jet and replacement with the later type of float chamber is recommended. The float needle bears against the seat at the bottom of the brass seating bush. If the seat is damaged the float chamber will have to be replaced. Early models of the Concentric were fitted with plastic float needles which should be replaced as a matter of course with the current Viton tipped float needles. Viton tipped needle valves are much more resistant to wear but should be replaced if there are visible signs of wear, contamination, or damage. If a punctured float is suspected, submerge the float completely in fuel for 15 minutes and shake it to see if any fuel has leaked into it. Check the float tabs for signs of distortion, and check that the float spindle is an easy rotating fit in the float with no stiffness or excessive play. The new adjustable height StayUp float is resistant to modern ethanol based fuels and has a military spec closed cell construction making it puncture proof. The ability to adjust the float arm allows for quick and easy minor alterations to float levels where required. Because there have been changes to the float chamber since the Concentric carburetter was introduced, and because there is no way of knowing what alterations may have been made by a previous owner, measuring the fuel level is the best way of setting up the float chamber.. 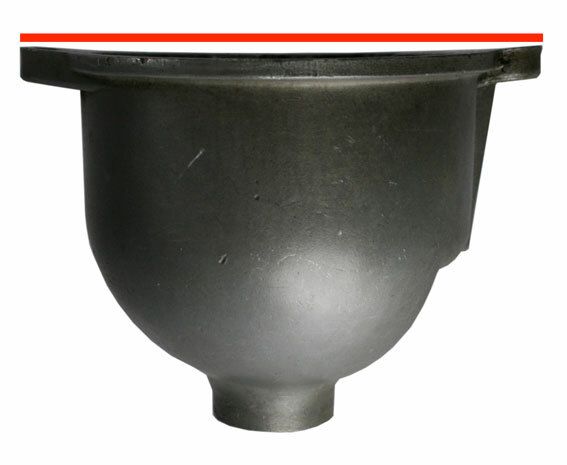 The correct fuel level for all Mark 1 Concentric carburetters is 0.21″ plus or minus 0.040″ below the top edge of the float bowl. Thus when the needle valve is being held shut by the tangs of the float, the level of the fuel will be between 0.017″ to 0.25″ (4.33mm to 6.35mm) from the top of the bowl. The fuel level can be checked by removing the float chamber and observing fuel running into it. The fuel flow should be sufficient to hold the needle valve open until closed by the action of the float. Insufficient fuel flow will cause the needle valve to seal under it’s own weight before the float rises far enough to press the valve shut. The level of the fuel can then be measured down from the top surface of the float chamber. The fuel level can also be checked by attaching a piece of clear tubing to the bottom of the float chamber. A plastic float chamber drain plug can be modified to mount a suitable spigot, such as an old jet, to attach the tubing. Route the tubing in a vertical position alongside the float chamber. Open the petrol tap and fill the float chamber with fuel. If the fuel level is in the correct range the fuel will rise in the tube to a point between 0.170″ and 0.240″ below the top edge of the float bowl. Start the engine and ensure the fuel level remains within the correct parameters. The new Amal “Stay Up” float has stainless steel tangs which can be bent to alter the fuel level. The tangs can be easily adjusted by clamping the float in a vice up to the spindle hooks and tapping the body of the float gently in the direction required until the required level is achieved. Check the manifold flange against a flat surface to determine if it has been distorted by over-tightening or tightening to an uneven surface. If there is distortion so that the throttle slide jams when the carburetter is bolted to the inlet manifold then the carburetter needs to be replaced. 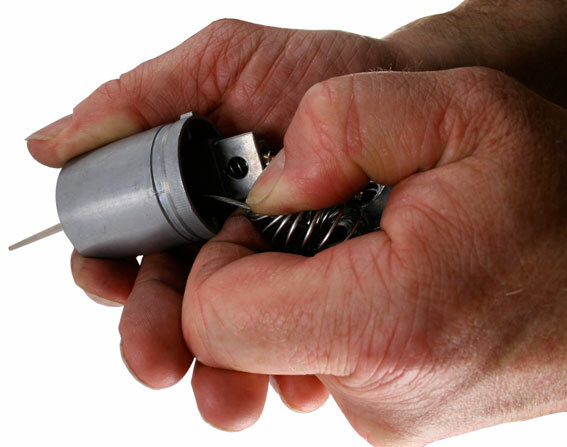 Replace the O ring if there is are any signs of hardening or damage. The free length of the throttle spring should be 3″. Replace if corroded, damaged or compressed. 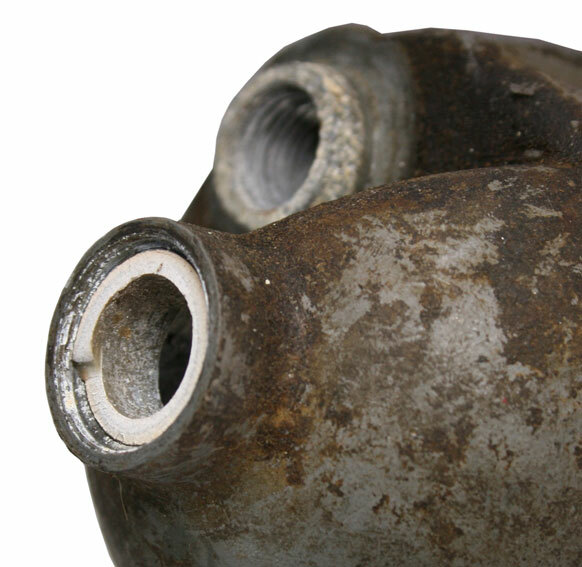 Inspect the air valve components for excessive wear or damage. Inspect the throttle slide for excessive wear. If the wear pattern on the engine side of the slide is visible as a series of furrows or waves in the metal or the step or groove at the top of the slide on the engine side has been worn away then the slide requires replacement. Eventually the mixing chamber body will also wear to the point where the amount of air leaking around the throttle slide prevents accurate tuning of the carburetter and a replacement carburetter will be required. Wear to the carburetter will be much reduced by ensuring that an effective air filter is always fitted. 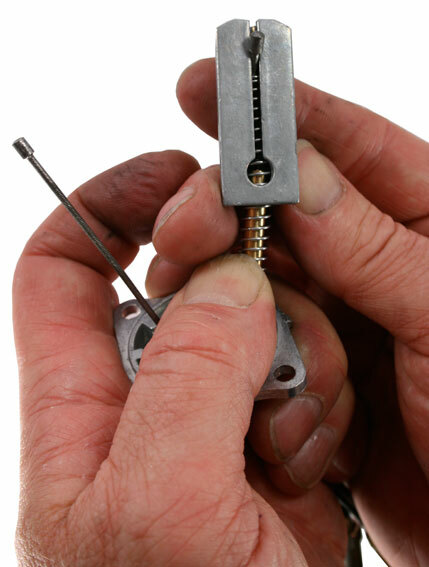 (b) Sleeving the carburetter to an incorrect clearance between slide and body will make the carburetter difficult or impossible to tune correctly. (f) Poorly sleeved carburetters can have the slide locating lug masked to the point where the slide can override the locating slot and jam. Mark 1 Concentrics are equipped with two types of pilot jets. 2 Strokes use a removable pilot jet which should be replaced if it is damaged or shows signs of oxidisation. 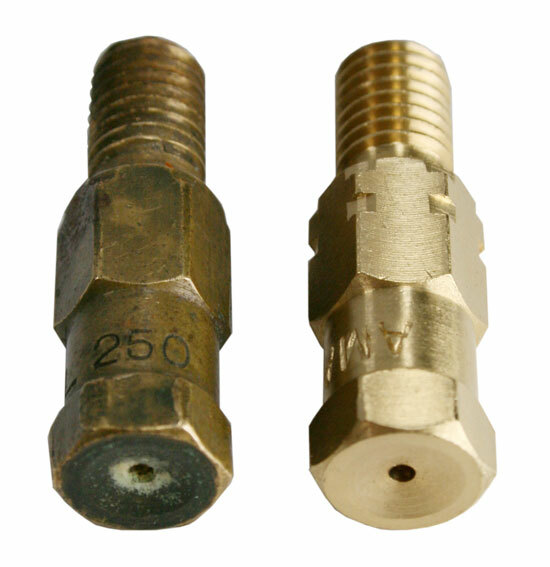 4 Strokes generally use a pressed in bush pilot jet in the gallery behind the pilot air screw. Fuel residues and oxidisation can cause problems with the pilot circuit, particularly in bikes that have been left standing with fuel in the carburetters for several months or more. It may be sufficient to clean the pilot circuit with an aerosol carburetter cleaner, stopping the various outlets selectively to ensure the entire system is clear. Do not forget to inspect the two pilot circuit outlet holes either side of the slide location slot in the bottom of the carburetter bore. If necessary the pilot bush can be cleaned by removing the pilot air screw and using a No 78 or 0.016″drill, held securely in a suitable extension, rotated lightly in the bush to remove encrusted deposits. Needle Jets are best replaced as a matter of course especially if the age of the jet is unknown. They are the most vulnerable of the jets to wear with only .001″ between sizes and a worn jet will cause very rich running between 1/4 and 3/4 throttle opening. Main jets are resilient to wear but old jets showing signs of oxidisation or any etched deposits should be replaced as their ability to pass fuel may be affected. In 1966 it was decided to standardise the 376/100 type jet for use in Monobloc, Concentric, GP and TT carburetters and changes were made to the jet to ensure compatability. The groove machined across the hexagon of the jet on the right indicates that it incorporates the modifications. New jets without the groove are not genuine, and are often extremely inaccurate. Always use new genuine Amal gaskets and O rings to prevent leaks. Manufacturer’s original standard carburetter settings are available in the Amal Catalogue and on the Amal Website. However unless a bike has retained absolute originality any changes to the engine, air filtration or exhaust arrangements (including modern replicas of original exhausts) may require adjustments to the carburetter. If you are not sure that you have a suitable carburetter the numbers on the raised pad on the side of the carburetter can be used to identify it. “R” or “L” stamped on the pad indicates a left or right handed carburetter. A “B” originally indicated that the carburetter contained the upgraded needle and needle jet parts. A three digit number beginning with a 6 or a 9 indicates the Series and bore size of the carburetter e.g. 624 indicates a 24mm 600 Series carburetter, 928 indicates a 28mm 900 Series carburetter. 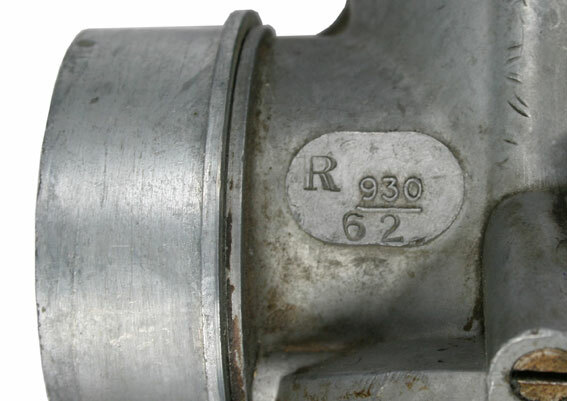 The Specification Number stamped below the three digit number identifies the jetting and the original model of bike the carburetter was fitted to, e.g. 62 below 930, read as 930/62 identifies a 30mm 900 Series carburetter for a 1971-72 BSA B50SS. It is also important to ensure that all the parts in your carburetter are correct for the engine type. The original Concentric carburetters used the same components for 4 Stroke and 2 Stroke and carburetters are often found to contain a mismatch of components. 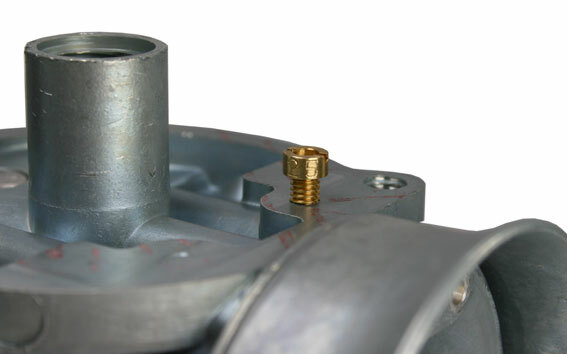 As a general rule the most noticeable difference between a 2 Stroke and 4 Stroke carburetter is the spray tube, the brass tube visible as you look through the carburetter bore. 4 Stroke spray tubes are cut off straight, 2 Stroke spray tubes are cut off at an angle sloping towards the mounting flange. Some later 850cc Norton Commandos use a spray tube with a square cutaway step while Triumph Triples use an angled spray tube cutaway from the mid point of the spray tube rather than right across as in the 2 stroke version. 2 Stroke and 4 Stroke bodies are not interchangeable and will not run correctly if used on the wrong type of engine. When first introduced all carburetters were fitted with a detachable pilot jet screwed into a threaded hole in the bottom of the carburetter body. This arrangement is retained for 2 strokes but from 1968 was replaced for 4 strokes by a bush pressed into the gallery behind the pilot air screw. The detachable pilot jet caused problems with some 4 Stroke engines. The remoteness of the jet from the two pilot circuit outlet holes caused starting and idling problems on bikes with lower manifold vacuums, and could cause stalling during deceleration due to a weak mixture. The introduction of the pilot bush moved the pilot jet nearer to the outlet holes to overcome these problems. The bush has a flow rate of equivalent to 20cc/min. Carburetters fitted with a bush retain the threads originally used to fit the removable pilot jet. The removable two stroke pilot jet is stamped with a number from 15 to 200 indicating its flow rate in cc/min. 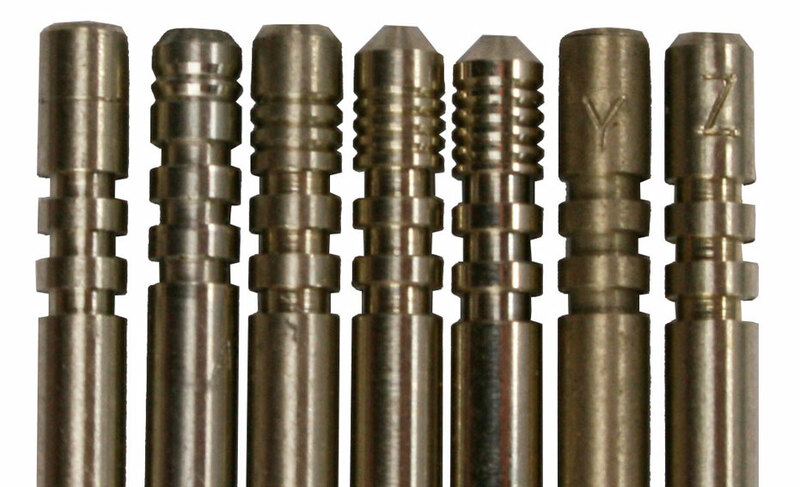 2 Stroke and 4 Stroke needle jets are stamped to show their sizes in inches from 0.105 to 0.125. 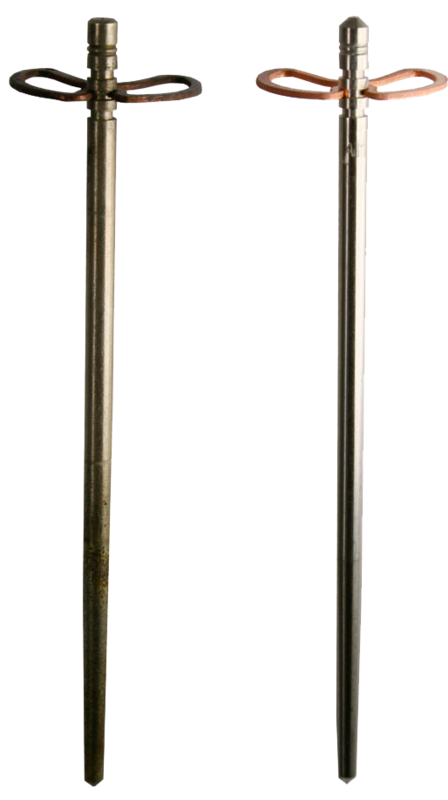 Four stroke needle jets have an air bleed hole drilled through the hexagon section. Two stroke jets have no cross-drilling. The angled cutaway on the slide manages the transition from the pilot circuit to the needle jet when the bike is running. Smaller cutaways will richen the mixture, larger cutaways weaken it. Many Amal parts are easy to copy but difficult to replicate. The simplicity of tuning and proper operation of the carburetter reflects the subtleties of the design. There are many crude and poor quality copies of Amal parts available, made from incorrect, rapid wearing materials, which will cause difficulties in the tuning and operation of the carburetter. All genuine Amal parts are now individually packaged and sealed for easier identification and are carry a 12 month warranty from the date of purchase. (b) Fit a new O ring to the Pilot Air Screw. Screw the screw fully home then back it out between 1 ¼ and 1 ½ turns for an initial setting. (c) Using the Amal Jet Key install the Needle Jet in top of the Needle Jet holder and tighten it securely. Take care not to over-tighten brass jets as they can break. (f) For Two Strokes carefully install the Pilot Jet into the bottom of the Mixing Chamber. (f) Ensure the lid is fitted correctly with the pip on the side of the lid pointing to the rear of the carburetter and securely tighten the screws. Always replace the carburetter fully assembled with the float chamber and mixing chamber top attached. The manifold flange and any heat reducing spacers should be carefully checked and dressed if necessary to ensure they are flat. 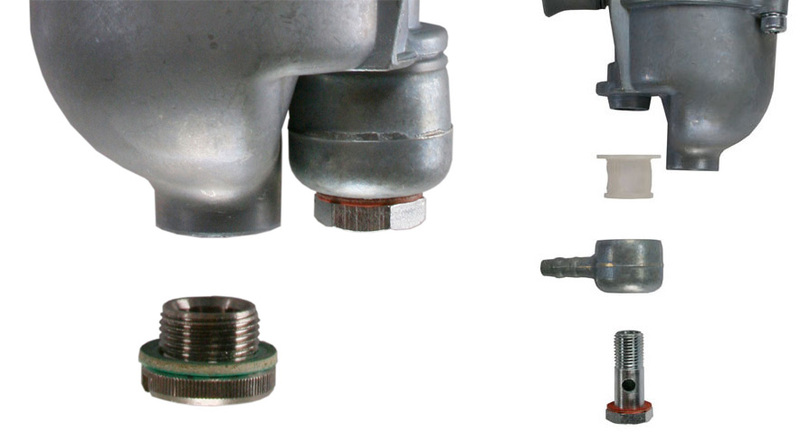 Bolting the carburetter to a distorted flange or uneven spacer increases the risk of carburetter body or flange distortion. The carburetter is one of the more reliable but most accessible systems on a motorcycle. 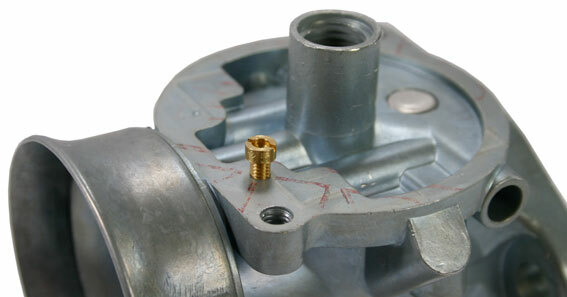 When considering a suspected carburetter fault bear in mind that air leaks or obstructions in the induction or exhaust systems, incorrect valve clearances, incorrect ignition timing, worn valve guides or piston rings can all affect the performance of the carburetter, while ignition faults such as worn advance/retard units can produce symptoms that resemble a carburetter fault.